I am ashamed to say that I only remember the war depicted in this book as little more than an intellectual enterprise. It was given to me by a friend of my wife's as we had just come back from a holiday in the region, and she thought I might be interested. In 1991, when the short essays in this book commence, I was 19 years old, and living in Melbourne, Australia. I remember the news coverage, as limited as it was, showed in point form the actions of one group of people visited upon another group of people, all of whom were on the other side of the world. News was like that in Australia in the early nineties. It's probably not much better now. This book was published in 1993. This makes it hard to read, since several times Drakulic talks about the war being "almost over". When one knows that the worst in the former Yugoslavia was yet to come this makes this depressing book even more depressing. It's true. 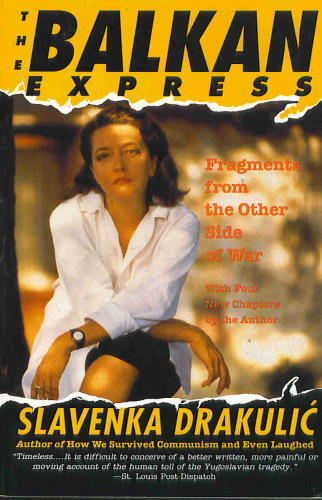 This is a hard book to read, not because of Drakulic's lack of writing talent, she writes supremely well, but because it describes the real hardships of everyday folk trying to go about their lives, while the dogs of war slaver in the streets below. This is a great if somewhat humbling read from someone who was there, but with no political agenda. Just a person whose world crashed around her, leaving her not overly interested in the political why, but definitely the personal processes that happen when war is all around you. If we are supposed to learn from history, why do people repeat these atrocities? I remember 1999 and what happened in Kosovo far clearer than I do the destruction of Yugoslavia in 1991. Melbourne took plane loads of Kosovo refugees and I remember watching them disembark via a TV report. It struck me then that refugee is a divisive term: Years of seeing African refugees starving in shanty towns had given me a pretty solid idea of what a refugee should look like. The Kosovo arrivals looked like me, they wore the same clothes, same shoes, all looked healthy. I remember saying to my girlfriend (now my wife): They could be passengers getting off a plane after any domestic Australian flight. These people aren't refugees, they could be us. A counterpoint to the passage above re: Drakulic's belief that the war was almost over, 5 years and hundreds of thousands of lost lives before. An open letter to Amazon: Things have to change.